Regarding the Growing Aging Population: The Inner Oracle Vol. II: Body. • As well as for those concerned with their own parents and understanding with empathy their current situation and circumstances. community and create a balance of give and take in all of our personal relationships with others. longer, happier, more loving, blissful and productive lives. extremely important. I spent many days and even nights visiting a friend at a seniors` home. We discussed what we felt was needed to reduce the costs in our ailing health care system. factors in reducing health care costs. Myths around aging include a myriad of comments and excuses. Can you relate to any of these? If you have suffered an illness or stroke, you might feel that you are too old to get better and lead fulfilling life. It is possible to recuperate from severe strokes, to learn to walk again, and to strengthen your body, mind and skills. The attitude that ``its all downhill from here`` is just another myth. However, it is possible to become a manifestation of your own thoughts and imagine symptoms of illness. Instead, send s positive messages to create a healthier mind and body even in your later years. “A community transforms when its members take charge of their lives and create their own destinies,” says Peter Sammarco, author of The Inner Oracle Collection. “While accepting the greatness and genius of every individual, we can build an interdependent community and create a balance of give and take in all of our personal relationships with others,” Sammarco says. Sammarco hopes that the advice in his book can change lives by helping readers live longer, happier, more loving, blissful and productive lives. Volume II—Body: A pragmatic approach to maintaining your body’s vitality and power at any age. 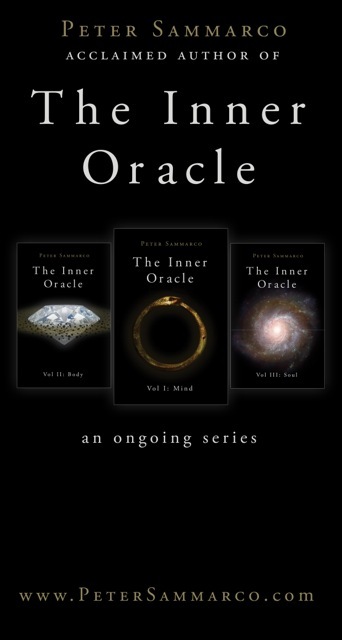 Peter Sammarco, author, keynote speaker, and advisor, offers empowerment and life enhancement through his books, now available in a three volume collection: The Inner Oracle.